Surfboard is a very cool service (similar to Flipboard on the iPad) that displays any website in a flippable newspaper-like display. All your different blog entries or pages are displayed and all the links stay alive. This makes the web reading experience a much more enjoyable one. 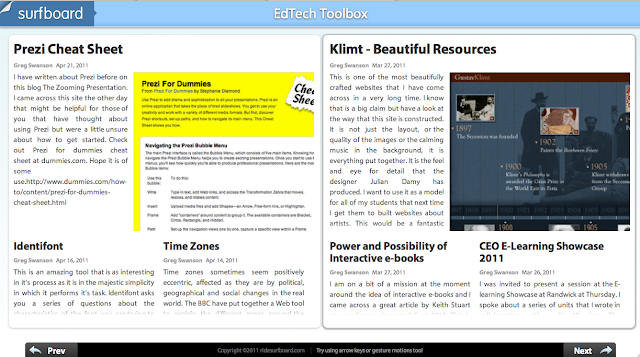 This is a great Web 2 tool for everyone! To use Surfboard all you have to do is enter the url of your favorite website and click "get surfing." That site will then be displayed in a manner that allows you to flip through the site's content without seeing the sidebar widgets and or advertisements. For proper flippable display Surfboard requires the use of the latest versions of Chrome or Safari. Surfboard was developed for use on tablet devices to make the content of websites easier to view on smaller screens. If your school is one that is starting to use tablet devices in your classrooms, Surfboard may be a service you'll want to check out. This is a great tool even for laptops and desktops, as it formats the website into a online magazine format without the adds and sidebars. Get your students reading again.